In the U.S., new homes are needed to replace older ones and accommodate growth in the number of households. Recent production, however, has fallen short even of the levels needed even to accommodate the number of net new households. One result is increasing pressure to keep existing homes in service longer. It should therefore not be surprising that the latest Census statistics show the number of homes built before 1970 declining at a very slow rate, with only about 6 out of every 1,000 being retired a year. Loss rates calculated by the Census Bureau for the purpose of estimating the number of housing units in the U.S. are quite low. The most recently published rates for conventionally built homes (nearly everything other than manufactured housing) in the Northeast and West are particularly low—under 1 per 1,000 lost per year. Such low rates of production and replacement are ultimately unsustainable, as they imply homes would last an unreasonably long time. While they persist, however, the built environment in the U.S. will change only slowly and continue to be dominated by structures that are at least several decades old. This in turn reduces the positive impact more recent improvements in development and construction practices can have on the built environment. 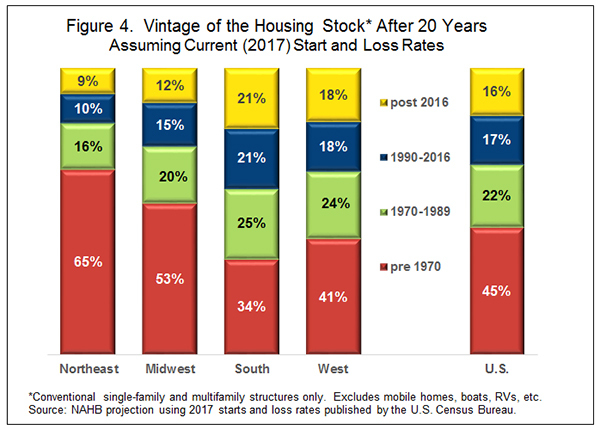 The source NAHB has traditionally used for information about new households is the Census Bureau’s Housing Vacancy Survey (HVS). From 2014 through 2017, the HVS shows an average of about 1.15 million net household formations per year (fig. 1). Over the same period, an average of about 1.02 single-family and multifamily homes were completed per year, and 1.12 were started. The source for information on both starts and completions is the Census Bureau’s report on New Residential Construction. As the figure shows, net new households are being formed faster than new single-family and multifamily homes are coming on line to accommodate them. The gap between completions and new households is almost 150,000. 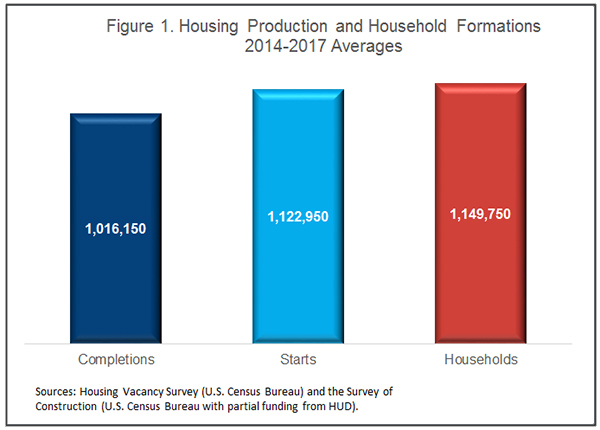 Although the figure also shows housing starts, primarily because the term start is more familiar to many readers, completions is the best comparison to household formations. A home isn’t available to a new household until it is completed. Recently, starts have outpaced completions, as the length of time from start to completion has been increasing for both single-family and multifamily construction. Part of the gap between new households and new single-family and multifamily conventional homes may be filled by manufactured housing (mobile homes), but shipments of manufactured homes have been running well under 100,000 a year—not enough to fill the gap, even if no old homes were removed from the stock and needed to be replaced. However, old homes do eventually become demolished or destroyed, and new homes are in fact needed to make up for the loss. In an April 2018 article published in Business Economics, Laurie Goodman of the Urban Institute estimates a rate of old home obsolescence. Combining this with data on completions and manufactured housing, she concludes that in 2017 the supply of new homes fell about 350,000 short of the level needed to meet demand. One result of the shortfall is pressure to keep older homes in service longer. 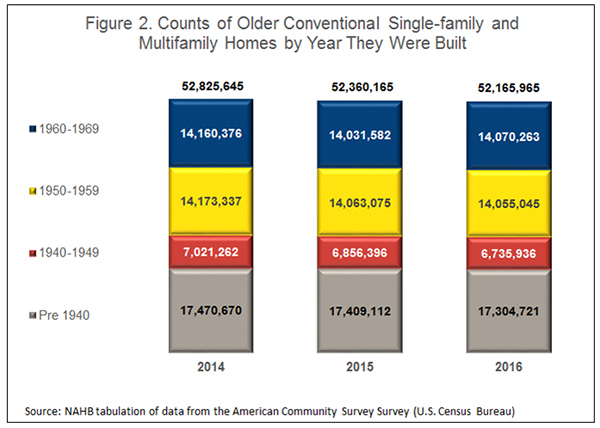 For convenience, this article defines conventional housing as single-family and multifamily homes as reported in the familiar Census series on starts and completions. This excludes manufactured and other types of housing, focusing instead on the types that NAHB members build, and that are regulated by local building codes. The standard source of data on age of housing in the U.S. is the Census Bureau’s American Community Survey (ACS). The ACS produces information an annual basis that used to be available only once a decade from the decennial census. NAHB tabulations of ACS data show that the number of conventional homes built before 1970 has been declining at quite a slow rate. There were 52.83 million of them in 2014, and by 2016 the number had fallen only to 52.17 million. This implies that only a little over 6 out of every 1,000 conventional homes built before 1970 are removed from the stock each year (fig. 2). The decline has been particularly gradual in the number of conventional homes built in the 1950s and 1960s. There were 28.33 million of these in 2014, and 28.13 million in 2016, implying that fewer than 4 out of every 1,000 are removed from the stock each year. To produce the counts of housing units shown in Figure 2, the Census Bureau needs to estimate the rate at which old homes are demolished, destroyed or otherwise lost (for example, by conversion to non-residential uses). The only data source really useful for this purpose is the American Housing Survey (AHS), which is funded by HUD and conducted by the Census Bureau in odd-numbered years. Because the AHS revisits the same housing units every other year, it can be used to estimate how many are lost in that span. To generate her estimate of a 350,000 shortfall in production in 2017, Laurie Goodman used AHS data to calculate an annual obsolescence rate of 3.1 per 1,000 homes. This encompasses manufactured housing and conventional homes of all vintages. 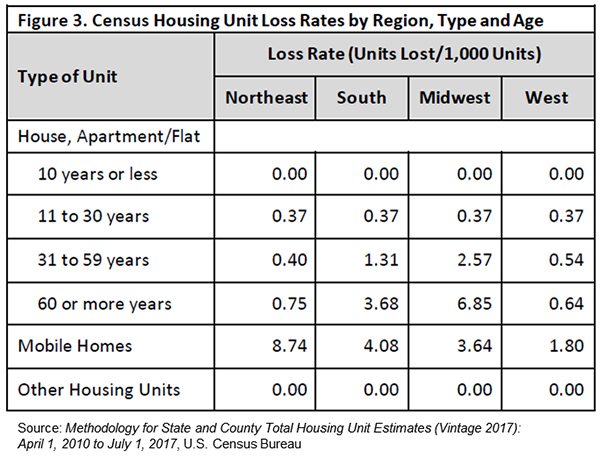 The Census Bureau also uses the AHS to calculate annual loss rates, and publishes the results in its methodology for estimating the number of housing units in the U.S. in intercensal years. The revised methodology for 2017 employs different loss rates for conventional homes (houses, apartments, flats) based on how old they are and in which of the our principal Census regions they are located (fig. 3). The Census loss rates for conventional homes are tiny—especially in the Northeast and West regions, where they are under 1 per 1,000 irrespective of how old the homes are. Were we to assume that these loss rates are both accurate and stable, the implications would be truly startling. Half of the new conventional homes built today would last over 300 years—150 years if built in the Midwest, over 200 years in the South, and essentially forever in the Northeast and West. That homes will last this long seems unrealistic, to say the least, so at some point loss rates for conventional homes will have to move higher than the latest Census estimates indicate. But to allow that to happen, something else needs to change. Unless Americans eventually stop reproducing, emigrate en masse to other countries, or move in with other families every time they change addresses, more new housing will need to be produced. And to the extent that the new housing doesn’t consist of mobile homes, boats and RVs, production of conventional single-family and multifamily homes will have to increase. This is taking a long-run perspective, however. In the short or medium term, it may be possible to keep removal rates low, and production of new conventional housing below its long-run average. Over the 40-year span from 1961 through 2000, conventional housing starts averaged a little over 1.5 million a year, but they have been nowhere near that high since 2006. If loss and production rates stay as they are in the latest Census estimates, the built environment in the U.S. will change only slowly—especially the part of the built environment that consists of conventional residential structures governed by local building codes. Were loss rates to remain as estimated in Figure 3, and 1.20 million new homes were built every year (1.20 million conventional homes were started and 1.15 million were completed in 2017, the highest these numbers have been in a decade), after 20 years only 16 percent of the conventional housing stock would consist of new homes built between now and then. In comparison, 45 percent would still consist of homes built before 1970 (fig 4). This stands in sharp contrast to the key assumptions used in, for example, Growing Cooler, an influential 2008 publication from the Urban Land Institute (ULI). The core of Growing Cooler is an estimate of the reduction in greenhouse gas emissions that could start to be achieved in 2050 if development patterns were changed between now and then, along with a set of policy recommendations. One of its key assumptions is that two-thirds of the built environment will be new by 2050, which in turn depends, among other things, on an estimate that 89 million new homes will be built between 2005 and 2050. This is, to put it mildly, a departure from the current reality. It requires nearly 2 million new housing units to be built every year from 2005 to 2050. So far, from 2005 through 2017, new home completions have averaged only 1.08 million a year. To reach the estimate in Growing Cooler, the U.S. would need to build about 2.3 million new homes every year from 2018 to 2050—over twice the current rate and more than have been built in any year in the country’s history. Some of the gap could be filled by mobile homes, boats, RVs, etc. It would require massive increases in the number of people living in these types of housing units to fill a substantial part of the gap, however. Moreover, these types of housing units are partially or totally out of the control of local jurisdictions with authority to regulate the built environment within their borders. This is not to be excessively critical of ULI, however, as the 89 million new home assumption seemed considerably more reasonable in the economic environment of 2008 when Growing Cooler was first published. Standard data sources show that the production of new housing has been insufficient to meet demand created by net new household formations. One of the consequences is that older homes are being removed from the housing stock at a very slow rate. These tendencies are especially true for conventional single-family and multifamily homes of the type built by NAHB members and regulated by locally adopted building codes. In the long run, the tendencies are unsustainable. While they persist, however, the built environment will change slowly and continue to be dominated by older structures—especially the part of the built environment governed by local building codes. Over the years, codes have been widely adopted and revised and improved many times. Significant changes to the structural requirements in codes, for example, were triggered by the experiences with Hurricane Andrew in 1992 and the Northridge earthquake in 1994. There have also been many changes to codes targeting fire safety, such as requirements for smoke alarms, fire separation, fire blocking, draft stopping, emergency escape openings, electrical circuit breakers, and capacity and outlet separation. Codes have also been increasingly used to advance public policies such as energy efficiency. As of May 2018, a version of the International Energy Conservation Code was being used in every state except California, which has had its own (repeatedly updated) energy efficiency standards for buildings since 1978. Energy efficiency requirements basically did not exist in U.S. building codes in 1970. In Builders and developers have adopted additional green practices and products on a voluntary basis—for example, by having their homes and subdivisions certified to the National Green Building Standard™. In short, in just about every way imaginable, new homes are being built to higher standards today than they were in 1970. Given the current low removal rates, any set of policies for improving the built environment should include a strategy for increasing production of new homes, so it becomes possible to retire more of the older ones. The HVS comes out every quarter, but is subject to considerable fluctuation and is not seasonally adjusted. For that reason many researchers prefer to look at average changes over a longer interval. Although the numbers are not large, the official counts of housing units include things such as boats, RVs and vans.